Cringeworthy examples of movies that shoved their sponsors too far into your face. For filmmakers, product placement is an increasingly lucrative sideline to hike up those all-important profit margins. It’s like the movie equivalent of native content, slotting the sponsorship right into the action and getting the ultimate endorsement from the silver-screen heroes themselves. Treated with a deft hand, it can feel relatively seamless and give brands a boost by subtle association. But as the Truman Show expertly parodied back in 1998, when it becomes too blatant, we suspend our disbelief and have a chuckle at the brand’s expense, or perhaps even get frustrated by the disruption to the action. Read on as we name and shame five movies that took things a little too far. "Leave Bond alone!" you may cry. This seemingly immortal franchise, gearing up for its 25th outing in 2020, has forged some truly iconic associations with luxury goods, from fast cars to flash gadgets to premium booze. Nor does it try to hide it: take a look at 007.com and you’ll see references to companies such as Aston Martin and Orlebar Brown. Sure, you might turn a blind eye to the camera lingering a little too long on the badge on a car’s grille; close-cropping on a smartphone screen or carefully placed laptop lid; maybe even our hero swapping his signature vodka Martini (shaken, of course) for a bottle of beer. You get the feeling that Michael Bay and the Transformers production team go into every product placement negotiation with dollar signs in their eyes. While Bond trades off class and sophistication – albeit treading a fine line between savvy and sell-out at times – Transformers is essentially a giant, explosion-filled toy box. For a movie franchise packed with vehicles of all shapes and sizes, it’s no surprise that the most ubiquitous product placement comes from a car brand: General Motors. And the badge shots are the subtle bit. At one point, in response to a disparaging comment about Bumblebee’s current form as a battered old Camaro, our hero defiantly transforms into the very latest model, straight off the production line and into the on-screen showroom. Transformers: Age of Extinction includes gems such as some fairly unsubtle centre-frame inclusions for Victoria's Secret and Beats By Dre, plus that incredible scene in which a Bud Light truck is smashed to pieces, scattering its distinctive blue bottles all over the road. Of course, Mark Wahlberg can’t resist a quick swig mid-chase, although the fact that he then chucks the rest of the bottle on the floor doesn’t say much about the taste. The newest Transformers film, Transformers: The Last Knight, was also lambasted for its blatant product placement. This one seems to have a particular focus on Chinese products, like the Chinese dairy drink Mengniu turning up in an American-style scrapyard, for example. To be fair, Jurassic World clearly has its tongue firmly in its cheek when it suggests that Verizon Wireless could sponsor ferocious cross-bred predator the Indominus Rex, and you could certainly argue that the movie’s increasingly in-your-face product placement is wittily self-referential. After all, Spielberg’s iconic 1993 film was all about the danger of trying to harness and commercialise the unpredictable, terrifying side of nature – and once again, the lesson was not learnt and utter chaos ensues. Beats By Dre and Mercedes Benz get plenty of airtime in the 2015 movie, keeping the kids entertained through prominent headphones and zipping our heroes at breakneck speed through the dino-infested jungle respectively. But perhaps the most amusing – or unfortunate – brand association is with Samsung, which has seemingly kitted out the entire park and all its residents via Jurassic World’s very own Samsung Innovation Center. This includes the security system, which features front and centre as the bloodthirsty prehistoric antagonist breaks loose. Oops. Films set in the future can be a difficult sell for specific product placement, since no brand wants their most cutting-edge wares to look outdated in the context of a visionary world. Luckily for Audi, the dystopian universe of I, Robot was the perfect arena to take its specially designed concept car for a spin. With spheres instead of wheels and reverse butterfly doors, the Audi RSQ got to ride around Chicago in 2035, with Will Smith at the wheel – garnering a healthy chunk of screen time in the process. That’s investment, and positions Audi as a future-thinking brand. We can’t quite see them, Will – can you raise your foot a little higher? But the scene in which Smith awkwardly hoists his foot onto a chair and proudly declares he’s wearing “Converse: vintage 2004” is a step too far by any standards. Again, when product placement enters a main character’s dialogue, it immediately jars. It’s testament to Tom Hanks’ acting prowess that he can carry the vast majority of Cast Away’s screen time single-handedly. 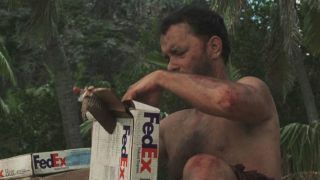 Of course, Hanks is not marooned entirely alone on the island – he has some brands for company. First of all, he’s a FedEx employee, on a FedEx plane, filled with FedEx packages. Branding aficionados certainly have plenty of chances to fawn over the ‘hidden’ arrow in Landor Associates’ much-loved FedEx logo, as it’s almost as ubiquitous as the sand on the beach that he calls home. And then there’s the other main ‘character’, and probably the most-spoken single word in the whole script: Wilson, the Wilson-branded volleyball. While some of the other brands on the list manage to find their way into the script, not many have the privilege of being bellowed at full volume by an Oscar-winner. However, director Robert Zemeckis has insisted that neither FedEx nor Wilson actually paid for their products to be shown – although they were provided free of charge, of course. So although a FedEx plane was seen crashing, and a Wilson volleyball got pretty badly battered, both brands did pretty well out of it, all told.